When working on a project, there are few more frustrating slow downs than not having the material you need where you need it, when you need it. 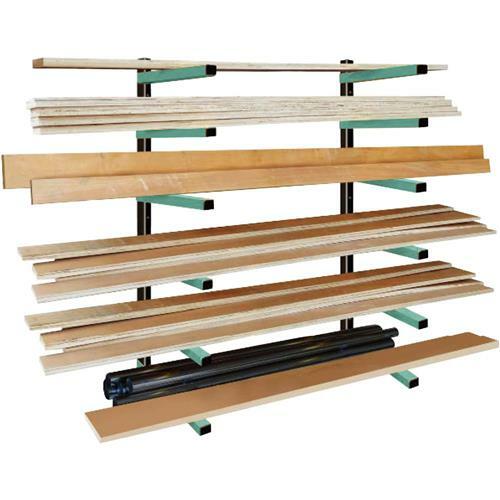 This six-shelf lumber storage system is just the thing for your shop to keep your materials quickly and easily organized and accessible. Easy to install into a sturdy wall, each shelf can hold up to 100 lb. and uses 1" powder-coated steel supports for a clean, long-lasting support. And it's not just for lumber; these racks can also hold PVC piping, pipes, gutters – any long material you need up and out of the way. Install them in your garage and never trip over your skis again! Each system comes with comes with 2 vertical support bars and a total of 12 horizontal bars (6 for each vertical support) to make six storage shelves. Full wood rack unit measures 72"W x 41"H x 12-1/2"D.
Worked out very well for my shop. Good, strong product. Have bought 3 of these to help organize my barn. Easy to put up, sturdy, and great value. Out of the package, everything looked very solid. Basic instructions made it very easy to install. Seems to hold a lot of lumber. Overall, very happy with my purchase. This system works awesome. Once mounted it is completly solid. I filled it and have no worries about it going anywhere. I havent had the chance to fully load it up yet. It appears well made, if there was only one concern is that the supports need to be closer, and 3 would be better than 2. There should be an option to purchase packs of 2 or 3. First of all, the quality of the rack itself seems pretty good. When installed (which is easy to do), the rack does its job well and looks nice. However, packaging/delivery wasn't so great. I ordered two originally, and the first one had evidence of being opened and had two of the horizontal bars missing. The second box was missing the spacers and hardware. I contacted customer service, and they were very helpful. They agreed to send another rack out. This one can within a week, but after opening it, all but one of the plastic stand-off spacers was smashed to bits. I haven't chased this issue down yet, but went ahead and installed a set to start getting some lumber off the floor. I bought 4 or 5 of these racks in order to eliminate everything on my garage floor. There were some shipment problems. One package had been opened and some parts missing while another package had been damaged and parts crushed. Grizzly resolved all issues and I am today most satisfied. I'm very pleased. Second order for outdoor storage shed. This rack system is so versatile! Can be used in more than one way! Would definitely recommend!! Very good product. I ordered several (4) and Grizzly split the order for some reason (2 x 2 boxes/sets). (Not in general an issue, but was a bit surprised as to how/why they split the order. Anyway, the first set of two that arrived were fine, but in the second set one of the boxes was split open and was missing one of the wall-mount rails + needed hardware, etc. Main point here.....great product AND customer service was GREAT in getting this handled and shipped me a new product immediately. While things can happen, Grizzly was just great in getting issues resolved very rapidly and professionally! Thanks Grizzly for your rapid service and ease of dealing with you Company!! Once again Grizzly delivers beyond expectation. The quality of this system was far greater than I expected for the price. I have yet to be disappointed by Grizzly. Love it and will buy again. Frees up tons of other space. Simplicity is what makes this great. Of course Grizzly has a better price than the competition. I bought two of these to allow three supports along 8' to enable storing 8-12' long boards. They seem very sturdy, and work well as rack/shelf supports without interfering diagonal supports. Since I had leftover parts, I made a couple extra vertical bars out of wood and wound up with 8 8' long racks/shelves. Had I noticed Grizzly sells spare parts, I likely would have bought the metal poles, but my maple versions seem to be holding up just fine. Strong, easy to assemble. Better price & same quality as competitors. Not sure about them since I bought 6 sets but haven't installed them yet. I bought two of these kit for lumber storage very easy to install and strong. I bought one set, installed them, and realized I had room for more up in my wood storage loft. Before these shelving units, the piece of wood I needed was always on the bottom of the pile. I now have a total of 5 of these racks which opened up a lot of floor space, cleaned up my storage and I'm really pleased. These units are strong, well made and provide maximum space to store wood. I'm so glad I bought this. Installed it in my garage. Doesn't interfere with car parking and allows me to organize and store my lumber. Just what I needed for my storeroom. Keeps the wood up and organized. I purchased two of the racks last month. One came missing the spacers and screw package. I spoke to a customer representative who was pleasant to deal with and even though it was just prior to the Christmas holidays, I had the parts I needed in a few days. This is my second order from Grizzly. Great products ,great customer service. I don'y buy everything I need for my wood shop from Grizzly, but that is where I begin my search. Trust is built over time. Grizzly has worked to established a good foundation with me. I was missing pieces. Called customer support and they sent out the parts that day. My woodshop is under construction,so I haven't installed the shelving yet,but the shelving looks well built. Looking forward to using it. Even better than I thought. Holds a lot of lumber. Allowed me to get my lumber stored up high and organized. I bought six of these units for my new shop. They are as advertised and FAR less expensive then identical racks from other woodworking sources. One of the six units was damaged in packing or shipping. i called G.I. and the customer service guy sent me a replacement. WELL DONE Grizzly! I bought four sets to store long and short lumber. The price is great compared to the "orange" version sold elsewhere and they worked fine. very sturdy and work area is much neater now. Standoffs need to be a bit thicker. Posts hit the wall and do not sit level. Sturdy though. I bought two sets. Liked them so much I bought two more. This is a great product. Does what I need it to do. 2 of the spacer grommets were broken, but I had a substitute. Looked like shipping damage. Other than that, these shelving units are fantastic for storing your lumber off the ground and out of the way. Suggest ordering 2 at a time for better support and load distribution. This is my second purchase of this product. I needed an addition for longer length. Very happy with this product as it performs just as it should. Fantastic easy to assemble and install. This got all of my stock off the floor freeing up a lot of room for me. Bought 3 sets and had it installed in an hour! Just got 2 sets of these and noticed the one box was ripped open. We weren't home to inspect the package and it was just left on the door step. Assembling them I noticed that I had only 11 horizontal bars instead of the 12 listed. Grizzly makes a great product but in the last 6 months I have bought a Band Saw, a Table Saw, these storage racks and a couple of stands. every single delivery has resulted in either damage or a missing part. Grizzly customer service has been wonderful but I shouldn't have to call them every time i order something. Very Frustrating. I bought two pairs about a month ago. I'm setting up a new shop space and while I had a home-built lumber rack it was a bit slapdash and I was going to have to unload it, remove it from one wall, and put it on another, then re-load it. The Grizzly system was inexpensive enough to convince me to just buy it and do a direct transfer. I'm lazy, so I took it. They're nothing fancy, but look good and have held up well so far. Poor QC. The sole purpose of lumber racks is to keep boards perfectly flat. Impossible to do when the rack has arms that sag by up to 1/4" at the end... Build your own out of wood like I should have done, and will now do. Its what I had expected and will work great in my wood shop. The package was torn open on one end but everything was still there. Just started getting my wood shop put together, these made it very easy to organize lumber. Assembles quickly and neatly. Holds a huge amount of lumber, without a whisper of strain. Make sure you set it on stud centers. Better price than Amazon. I purchased this product to hold my wood pieces in my shop. It is very well constructed, easy to assemble and to mount on the wall. It holds a fair amount of wood which allowed me to clean up my assorted places I had put boards in the shop. I certainly recommend it and would purchases it again without hesitation. I bought 5 of these for mt racking in my enclosed trailer, worked great. I needed some heavy racks that would go up quickly. These filled the bill. quick shipping also. Exactly what I needed and simple to install. A great product! The lumber rack went together fast and stores molding and plastic piping. I have also used it to hold some pine shiplap that I am using for a feature wall. I was surprised at the strength of the units. I have two sets mounted so that I can get 8' lumber stored. For the money and convenience you can't go wrong with this product. I've had it about a month and it's still on the wall so i think that warrants 5 stars. If it ever falls off the wall, I'll come back and change this to 1 star. Until then, you can assume this lumber rack will hold your lumber effectively. It's a lumber rack people, it ain't a drum sander with a digital readout. Why are you reading this review still? I'm curious. What would possibly sway you from no buy territory into buy territory in a lumber rack review? What can it possibly do besides hold lumber? It's a binary product. It works or it falls off the wall. I bought two of these and they have provided an organized storage system for the jumble of materials once kept in an overhead rack. Everything is now neat and easily accessible in a system that is both economical and well engineered. Stronger than it's compact size appears! I was considering scratch building a storage system to hold molding and dimensional lumber. The price was right and I didn't have to spend much over a half hour to set up and load this rack system. I am pleased with these racks. They were easy to put up. This was simple to install and did a great job organizing my loose lumber. I watched a youtube review which liked the unit also. They recommended using 1/4 lag bolts to attach the racks and it is what I used. I will consider getting more as the need arises. Nothing fancy. It just does what it is supposed to do. I bought this a month ago, and Im so glad I did. Not only was it easy to install, but it instantly made my shop space much easier to navigate because of how organized this rack system is. Thanks grizzly! Installed the wood rack with 5 shelves, instead of 6. I did not need the top 6th shelf. I now have a drawing table to use for drawing instead of storing my lumber on top of. Very good quality, very strong and nice paint. Can't beat the price. It worked out well, except that the box was opened and an arm was missing. 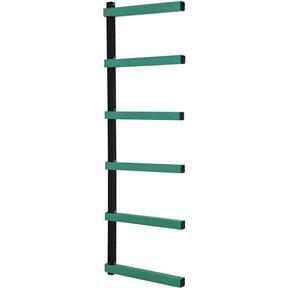 I have about 8 of these in my new garage, I have seen these same racks, different colors, priced 2 and 3 times as much as the Grizzly branded racks. Thanks Grizzly, my tool and shop stuff shopping always starts with you all. Maybe two of the little spacers (48 total in my order) that go between the racks and the wall got smushed during shipping, but you just need a little wood scrap to replace if that occurs, not an issue for shop type people. I have used these racks for years to keep my lumber inventory organized. Always worked very well and made getting the material down much easier on my back. Great for the price. Ive bought 3 sets and ordering 4 more for family. Was perfect for storing the slabs of wood in my shop. 15 slabs at 12-14 ft and holds the plus other wood no problem.